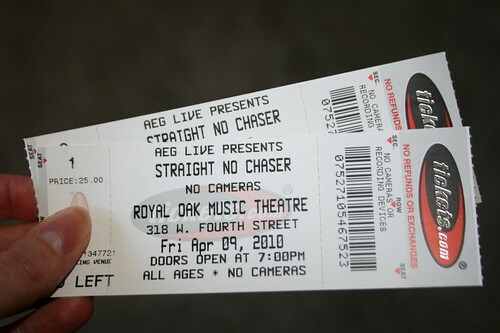 We are sitting in our seats at the Royal Oak Music Theater waiting for the Straight No Chaser concert to begin. If you don't know who they are, just type their name in YouTube's search box and be prepared to be amazed. The concert was AWESOME. We loved it. I could listen to them sing all day. We were a little mad about one thing though. The tickets said no cameras (see below). So being the good rule abiding people we are, we didn't take the camera in. At the intermission there was an announcement that said SNC's policy is to allow pictures and videos to be taken. (After all youtube is how they got to be were they are now.) Mickey recorded a few songs with his phone. Not sure how well they turned out. We could have recorded the entire show. Now I'll have to see them again so I can. I found a few videos someone else got. Here. Here. And here. Here's the picture I was going to use yesterday but the WiFi at the hotel was so s-l-o-w I couldn't post with the iPad.